Ireland flanker Josh van der Flier will miss this week's final Six Nations game against Wales in Cardiff after being withdrawn from the squad with a groin injury. 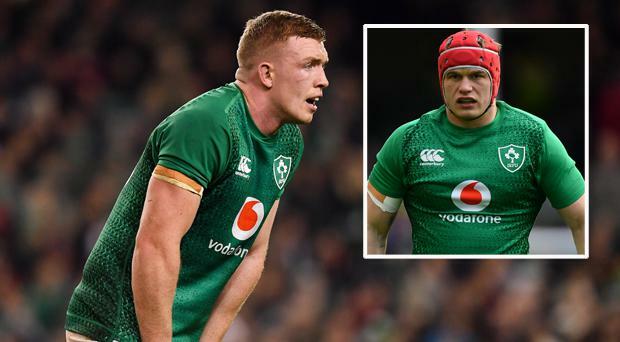 However, his absence has been countered by the return of Dan Leavy who, if he proves his fitness after calf trouble, may be involved with a selection tussle with Leinster colleague Sean O'Brien, who was axed for last weekend's win against France. Van Der Flier was withdrawn in the first-half of Sunday's win against France. "Dan Leavy has joined the squad and he's here to make sure he looks good, we'll see how he goes this afternoon," said scrum coach Greg Feek. "It's a short turnaround, we'll see how training goes. Sean has been training hard and that puts him into contention. We have a few options there but we'll see how it goes in training. "Tadhg Beirne was sore last week but he will hopefully train and be available for selection. He's a determined young man and has a lot to offer, it's a competitive position in the second-row. "We need to deal what's in front of us, if he goes well today and gets his detail right, he will put his hand up." Rob Kearney (calf), a late withdrawal from Sunday's XV, and Joey Carbery (hamstring) will hope to have a light runaround today but both are expected to be available with Schmidt likely to tinker further with his squad given a tight six-day turnaround. "It's a wait and see but it looks like they're both ready to rock n roll," said coach Greg Feek. Ross Byrne has been released from the squad. "It's important to get some momentum from the France game," adds Feek. "It was good to see almost three games in one half all come together, a keenness and a willingness to keep it going. "It's going to be difficult to do it again, Wales will be primed. But that accuracy and intensity we had on Sunday is a good starting point. "There is always pressure in a test match and there is excitement from us preparing to go there, with the rivalry and everything they have at stake. But there are a little things to work on." Predictably, the issue of the roof in Cardiff's Principality Stadium will remain an open and shut case unless both sides decide whether to open or shut it. Ireland agreed to close the roof two years ago in a venue where Schmidt has never tasted championship success but the team were irked after it was revealed that Warren Gatland had ordered stadium officials to water the pitch. "We'll decide on the roof issue in the next few days," says Feek. "The forecast isn't great but that shouldn't affect the skills at this level of rugby. It's out of my control, the coaches together and a few players will have input into the decision. "There was a rumour they watered the pitch two years ago. But listen, it's a good story but in terms of bothering us, you can pretend it does but it doesn't really."